Mr Green is celebrating its birthday in fine fashion – and you are welcome with Spinata Grande and Aloha! Cluster Pays to celebrate their birthday. 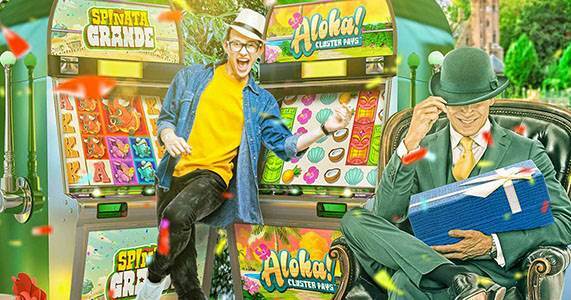 Each wager of €10 on Aloha! Cluster Pays and/or Spinata Grande will enter you in a €50,000 cash prize draw. On the 20th March we'll be drawing winners with all cash prizes credited by the 21st of March. Spring Break promotion - Win a Trip to Vegas and iPhones! Mr Green is celebrating the Spring break and they are offering cash prizes, a total of 10 iPhone 7s, and a six day trip to Las Vegas! You can enter the promotion simply by wagering. Real money put down on Beauty & the Beast can result in a random bonus chest that holds a cash prize. Cash will be credited instantly inside the game and the prizes are free from any wagering requirements. The total amount given away is €2,000. For the grand prize, one player and a guest will depart on a romantic retreat to Colmar, France which is a quaint town resembling a scene from Beauty and the Beast. You can enter the draw very easily and all you need is at least 50 spins. Hang on until the 22nd of March when Mr Green will draw a lucky winner from a hat. Terms & Conditions apply. Full promotional details at the website of Mr Green. Check out the latest Mr Green Promotions Now!